How to take care Katana (刀の手入れの仕方). Katana is Japanese style sword. To keep it in great condition, you must take care of it constantly. Katana is made from Iron and other metals. Therefore, Katana must be coated with oil to prevent oxidization. It is also very important to know the manner of Katana. If you have Katana, please take a look and study the correct way of taking care Katana. Katana is usually stored with this kind of bag. After took out Katana from bag, grab Tsuka with right hand, and grab Saya on left hand. Then draw out Katana by left hand. These are what you need for taking care Katana. Remove Mekugi of Katana by the hammer. Put small stick onto Mekugi, and knock to remove Mekugi. Grab the bottom of Tsuka by left hand, and know left hand by right hand to loosen up the blade and Tsuka. This part is called "Nakago." Between Nakago and the blade, there are "Seppa" "Tsuba" "Seppa" and "Habaki." Wipe the blade with a paper or a fabric. Remove old oil on the blade. You can't remove all oil by a paper or a fabric, so put Uchiko on the blade. Put Uchiko on Mine side as well. Then, again wipe oil with Uchiko. Add the oil on a paper or a fabric. Add the oil on the blade. You use a new oil on the blade, but you can use old oil on Nakago. Lord Habaki, Seppa, Tsuba, Seppa, and Tsuka. Hit the bottom of Tsuka to tighten the blade and Tsuka. Put Mekugi back on Katana. If you can't push enough by fingers, use a hammer. Take Saya on left hand and put Katana back into Saya. Wind a cord 3 or 4 times. On the last roll, put in the cord under the previous roll from over to bottom. Then spread them to sides. Put the tails of the cord to the other side. Then tighten up with spread cords. "Tips for taking care Katana that used for Iai Practice." Those katana has sweat and sebum from a person. Uchiko and a paper is not enough to remove them. Prepare a towel with water, hot water is better. Then, wipe the blade with it. You can remove all sweats and sebum better. Then, wipe water with dry paper or fabric. Make sure remove all water. 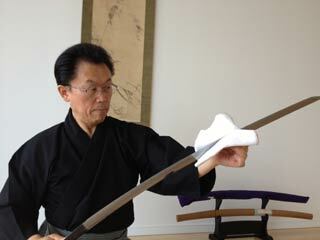 The Instructor: Mitsuyoshi Imai Sensei (21st grand master of Muso Jikiden Eishin-ryu Yamauchi style).